Start off your visit on the 30th (Sun): snap pictures at Golden Gate Bridge and then enjoy the sand and surf at Fort Funston National Park. 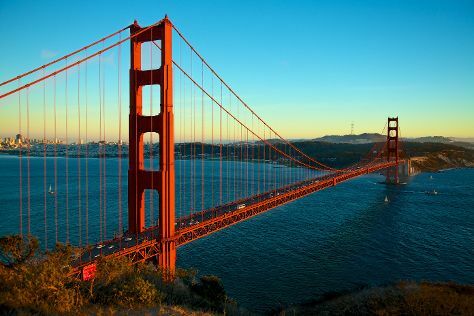 For photos, where to stay, more things to do, and more tourist information, go to the San Francisco trip itinerary planner. Newark to San Francisco is an approximately 7-hour flight. You can also do a combination of train and flight; or drive. You'll gain 3 hours traveling from Newark to San Francisco due to the time zone difference. Expect slightly colder temperatures when traveling from Newark in June; daily highs in San Francisco reach 71°F and lows reach 55°F. Wrap up your sightseeing on the 30th (Sun) early enough to drive to Carmel. Carmel-by-the-Sea, often simply called Carmel, is a city in Monterey County, California, United States, founded in 1902 and incorporated on October 31, 1916. Start off your visit on the 1st (Mon): stroll through Pacific Grove Shoreline Parkway Marine Refuge, contemplate the waterfront views at Monterey Bay, and then immerse yourself in nature at Point Lobos. For reviews, where to stay, other places to visit, and tourist information, use the Carmel trip tool . Traveling by car from San Francisco to Carmel takes 2.5 hours. Alternatively, you can fly; or take a bus. In June, plan for daily highs up to 68°F, and evening lows to 53°F. Finish up your sightseeing early on the 1st (Mon) so you can go by car to Yosemite National Park. Step out of the city life by going to Bridalveil Fall and Yosemite Falls. Discover out-of-the-way places like Tunnel View and Olmsted Point. And it doesn't end there: explore the striking landscape at Glacier Point, trek along Panorama Trail, and tour the pleasant surroundings at Tuolumne Meadows. To find more things to do, where to stay, maps, and more tourist information, you can read our Yosemite National Park trip itinerary maker . Getting from Carmel to Yosemite National Park by car takes about 5 hours. Other options: do a combination of flight and car; or do a combination of shuttle, flight, and car. Traveling from Carmel in July, expect nights in Yosemite National Park to be a bit cooler, around 46°F, while days are somewhat warmer, around 83°F. Wrap up your sightseeing on the 4th (Thu) early enough to travel to Cascade Locks. Cascade Locks is a city in Hood River County, Oregon, United States. 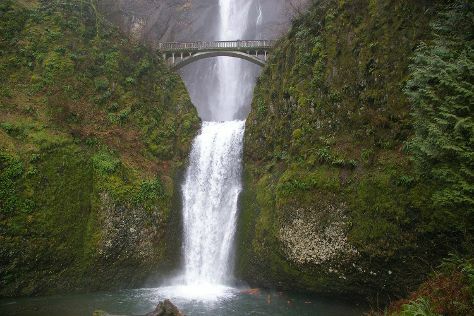 Start off your visit on the 5th (Fri): take in the dramatic scenery at Multnomah Falls, then take in the dramatic scenery at Punchbowl Waterfall, then admire the sheer force of Starvation Creek State Park, and finally admire the majestic nature at Starvation Creek Ridge Loop. To find reviews, more things to do, and more tourist information, go to the Cascade Locks day trip planning app . Use the Route module to find suitable travel options from Yosemite National Park to Cascade Locks. Traveling from Yosemite National Park in July, expect a bit warmer with lows of 58°F in Cascade Locks. 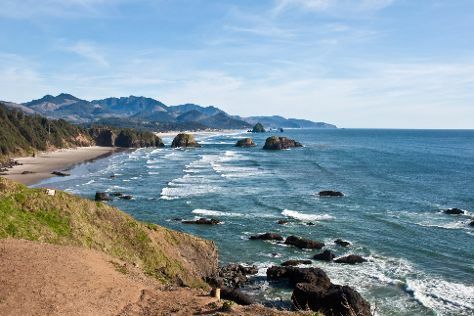 Wrap up your sightseeing on the 5th (Fri) early enough to drive to Cannon Beach. Cannon Beach is a city in Clatsop County, Oregon, United States. Start off your visit on the 6th (Sat): enjoy the sand and surf at Cannon Beach, explore the striking landscape at Haystack Rock, and then admire the majestic nature at Hug Point State Park. To find traveler tips, maps, where to stay, and more tourist information, read Cannon Beach travel planning app . Traveling by car from Cascade Locks to Cannon Beach takes 3 hours. Alternatively, you can take a bus. When traveling from Cascade Locks in July, plan for slightly colder days in Cannon Beach, with highs around 69°F, while nights are about the same with lows around 55°F. Finish your sightseeing early on the 6th (Sat) so you can travel back home. Your day-by-day itinerary now includes Redwood National Park. Kick off your visit on the 7th (Sun): immerse yourself in nature at Redwood National Park. Keep things going the next day: kick back and relax at Enderts Beach and then stroll through Trillium Falls Hike. To find where to stay, more things to do, and more tourist information, you can read our Redwood National Park travel planning tool . You can drive from Cannon Beach to Redwood National Park in 8.5 hours. Another option is to fly. Expect little chillier weather when traveling from Cannon Beach in July: highs in Redwood National Park hover around 64°F, while lows dip to 52°F. On the 9th (Tue), wrap the sightseeing up by early afternoon so you can travel back home.